Lock in a great price for Hotel Villa Madruzzo – rated 9.2 by recent guests! This was just suppose to be a stop along the way home and found that this turned out to be a gem. We will definitely return. Booked on Booking.com and found a great price. at check in they asked if we wanted to join them for dinner and said yes. Best answer of the day. Turned out to be a Michelin Rate restaurant....! Best meal of the trip...that month...since living in Europe...! Absolutely loved the location. My room had a view of the mountains, vineyards, and the town. The hotel has dinner in the garden which was delicious and very reasonably priced. This is like my 5th time in this hotel. It is far from Trento but that is what I like. It is far enough but not so far, and one enjoys the views from the amazing dolomites closer. 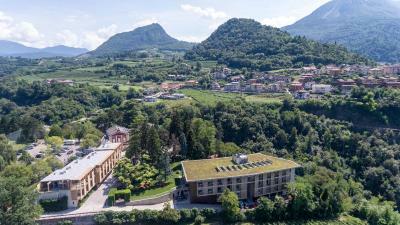 Fantastic hotel middle of beautiful Trento mountains and has swimming pool, great dishes. beautiful hotel, excellent staff. very good breakfast .comfortable bed . beautiful view from the room. very pleasant hotel. every thing was as it should be great place i loved it . The property was in a beautiful location and it was fairly easy to drive and park in Trento. We enjoyed the restaurant which serves excellent well priced meals. - very helpful and nice staff; - excellent breakfast; - very nice restaurant with good service; - comfortable bed; - cozy but not too private balcony; - nice view. Hotel Villa Madruzzo This rating is a reflection of how the property compares to the industry standard when it comes to price, facilities and services available. It's based on a self-evaluation by the property. Use this rating to help choose your stay! 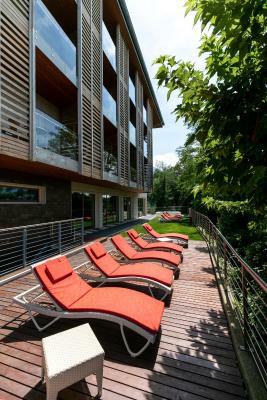 Villa Madruzzo is a 4-star hotel set in a peaceful position in the hills above Trento. It features a modern wellness center with indoor pool, sensory showers, steam bath, Turkish bath and outdoor hot tub. 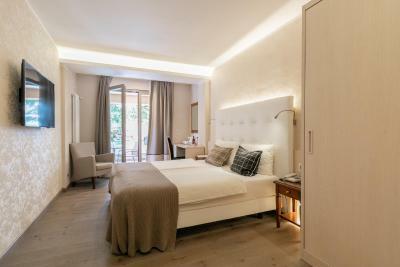 This chic property includes a historic villa and a new building, connected through the garden. All air-conditioned rooms offer hi-tech comforts such as an LCD-screen TV and free Wi-Fi. Some rooms feature original 19th-century furniture. Some come with exposed wood-beam ceilings and views of the surrounding parkland. Relais Villa Madruzzo has 3 dining halls on the ground floor. Here you can savor delicious regional, Italian and international cuisine. The restaurant uses only fresh, top-quality ingredients and offers local specialties, homemade desserts, and a vast selection of wines and grappa. A buffet breakfast is served daily. During the summer you can dine on the outdoor, open-air terrace. Friendly staff can assist you with tours, suggest new itineraries, or aid in the organization of events and meetings. Parking is free. 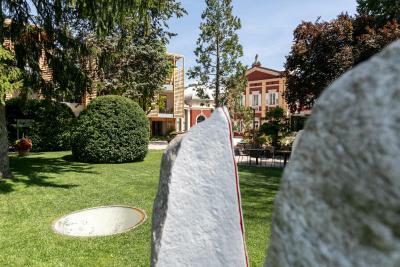 You will receive a free Trentino Guest Card, which gives free access to public museums, castles and nature parks. 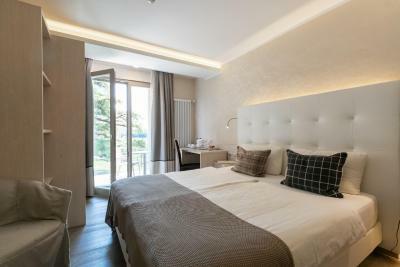 You will also profit from unlimited use of local public transport, including Trentino trains and Trento-Monte Bondone ski shuttle for the entire stay. 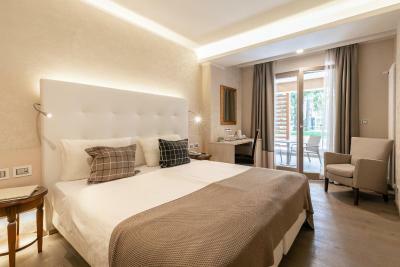 When would you like to stay at Hotel Villa Madruzzo? In the loft, on the second floor, with exposed wooden beams on the ceiling and air conditioning, this room features free Wi-Fi and an LCD TV. This room has a modern design and air conditioning. It features free Wi-Fi and an LCD TV. This room in the new building has a modern design and air conditioning. It has free Wi-Fi and an LCD TV. In the historic villa, this room features elegant furnishings, air conditioning and a free bottle of mineral water. Some rooms have a four-poster bed. This room has free Wi-Fi and an LCD TV. House Rules Hotel Villa Madruzzo takes special requests – add in the next step! ATM card Hotel Villa Madruzzo accepts these cards and reserves the right to temporarily hold an amount prior to arrival. Hotel Villa Madruzzo accepts these cards and reserves the right to temporarily hold an amount prior to arrival. Access to the wellness center facilities comes at extra charge. Please note that the hot tub is only available in summer. Please note that on Sundays the restaurant is open for dinner only. No need to get every day new bathrobes and towels to use the spa and pool area! The whole world should pay attention to save energy and water! The hotel is just awesome and in this area you cannot find anything better. 4stars are more than correct even it should be certified as 4star superior. An unbelievable mix between historic and modern in perfect condition. But absolutely outstanding is the whole staff in the hotel and the restaurant. As guest you are feeling really welcome and they do everything possible for their guests. The manager and his employees love and live their job very authentic with their presence at any time. For Italy the breakfast is anyway incomparable but travelling around the world the breakfast has the highest standard you can find. Same is the restaurant at lunch time or at night. 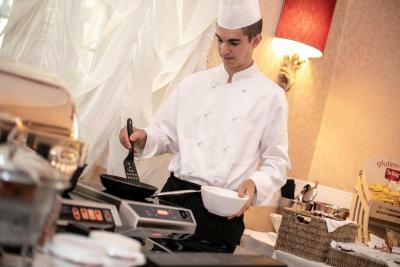 The menu provides an excellent mix between typical Italian kitchen and international standard. Result - we stayed one day longer and booked our next stay already when we left! Room temperature a little too hot, electronic temp. control didn't seem to work. Really nice staff and amenities. Easy parking. Amazing restaurant at a fair price, really worth it. Unbelievable breakfast. Loved the guest card that allowed us to visit Trento top attractions for free. Everything, it is always a joy to stay here, and the staff couldn't be nicer and move helpful. Thank you. Excellent buffet for breakfast, very good meals! Staff very customer friendly and efficient. Room was a bit warm at night. Not sure if the heating was on? Room was big and modern. Lovely balcony overlooking the mountains. First hotel in europe we have stayed in that had the shower seperate from the bath. Beautiful property. Very helpful staff. The gym was limited and there are no free weights and only machines. The sensor light above the bar fridge was annoying and had to be turned off as everytime we moved in the room it went off. The breakfast was the best I’ve ever had. The staff quirky and fun and really committed to our comfort. Overall very responsive to our needs and very flexible attitudes. GREAT LOCATION PRIVATE PARKING WITH GARAGE VERY COMFORTABLE ROOM EASY ACCESS FROM GARAGE FOR LUGGAGE . VERY HELPFULL STAFF.GREAT FOOD IN RESTURANT . SPA FACILITIES GREAT NICE POOL .l WISH I HAD A LONGER STAY LOOKING FORWARD TO RETURNING .